Here’s a bit of mid-week cheering up. Just for fun and a quick head-count of our members, a very simple Which Watch? Not a competition, no prizes, so try not to use outside help, i.e. Google… Okay okay, if you can’t stop yourself from Googling, please only do that after submitting your answer. 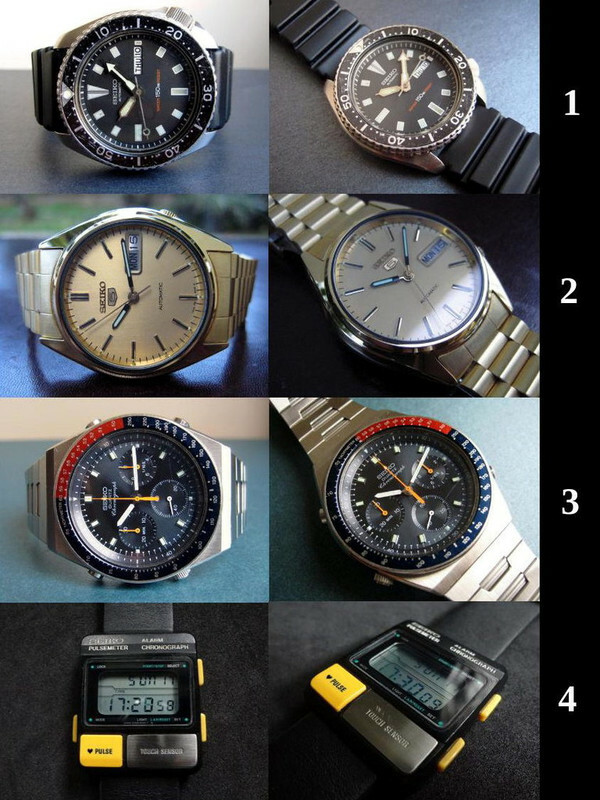 QUESTION: Which of the following four Seiko watches is the oldest? ...By this, I don’t mean when the model was released. I’m not referring to the condition, New Old Stock, and nothing tricky. Just straight up which has the earliest Date of Manufacture on its case back, i.e. which left the factory first? Done. Would have thought there is not much between some of them. Thanks! Hmmm,.. Well, I did try to make it challenging ...Let's just say that the smallest age gap between the four is 11 months, and the largest age gap is 13 years. Oh god... so whats the 1st thing to do... go through all Don's posts I guess, looking for the watches? Guessing, #2 or #3.... but don't really know. Thanks Don. Have voted and now await the big reveal. I thought a wee bit of deduction would help suss it, but nah... I basically threw a dart. SEIKO 5 has been around a long time, thats all I know... the Pulsemeter and diver are newer, pretty sure... came down to the 5 & Chrono for me. 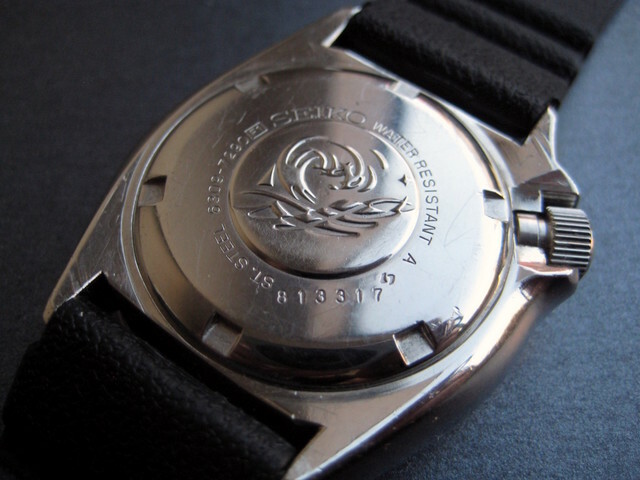 there is 1 watch that woud never be in production now... I chose that one. Oh! Cryptic!? 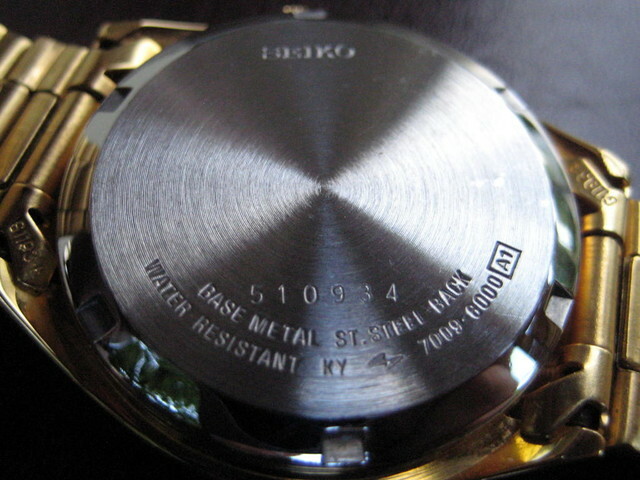 ...Creative strategy, and you got me downloading the latest Seiko catalog ..Thanks! I picked one of the quartz ones... 80s period. Diver issuer, I hope. 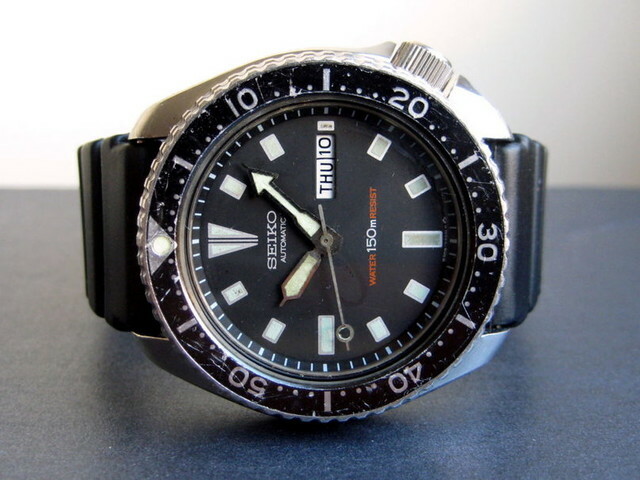 SEIKO 5 could be anytime! The Diver is all original, so no tricks. Actually all four are more or less all original, except the replacement straps on the rectangular digital--funny enough the straps on that last one is a genuine leather set from an LG smartwatch ...Yes, Seiko 5 is a hard one, though with the applied "5" logo, it would be post-1970. Last edited by Don; 22-03-19, 14:30. Unless it’s a reissue or reproduction? And I'll add that none of the four are re-edition or re-issue. They are all general release models, either International or JDM release. Thank you for taking part in the Which Oldie is Oldest? Poll. 16 votes were tallied, so um… really hope that this is not all the active members we have Anyway, today, as promised, I’ll reveal the answer. However, I’d like to do this one by one, partially to milk all the suspense possible , and second, as it’s rather late in the evening here. I’ll go by numbers, from 1 to 4. Now, these are tricky, and as I said in one of my comments above, had I been the one guessing, I doubt I would have chosen the correct watch as the Oldest. Indeed some of these watches could have shared the same catalog year—I have not actually checked—making hard the task. However, here is what is so wonderful about post-1970 Seiko: It is a wonder in itself for watches as diverse as these to have possibly even been on the same catalog. You won’t ever find vintage catalogs of any Swiss brand with such an array and mind-boggling variety as you do with Seiko. I’m amazed that more people did not think this to be the oldest, because it could have very well been! What is it exactly?… Well, it’s a more modern style slim-case mainstream Diver, so either a Quartz 7548, Automatic 6309-729x, 7002-700x, or current 7S26 SKX007. Dial says Automatic, so not the 7548. Dial says 150m, so cut out the SKX. Day/Date movement, meaning it could only be the 6309-729x (7002 is Date-only). Rectangular indices confirms, as does the flat-vent Z22 rubber. See what I mean? … Getting a look at this, you’ll need to know that the Cal 7009 belongs to the 3rd Generation (last gen) of the 7000 Series, and the movement itself was manufacture from 1980-1995. And… we’re still scratching our heads as to whether it is January of 1985 or 1995 Well, this one I happen to know because it was my dad who bought the watch new from a Seiko dealer around 1997, and it was, at the time, a recently-discontinued model at the time (Cal 7S26 debut in 1996). 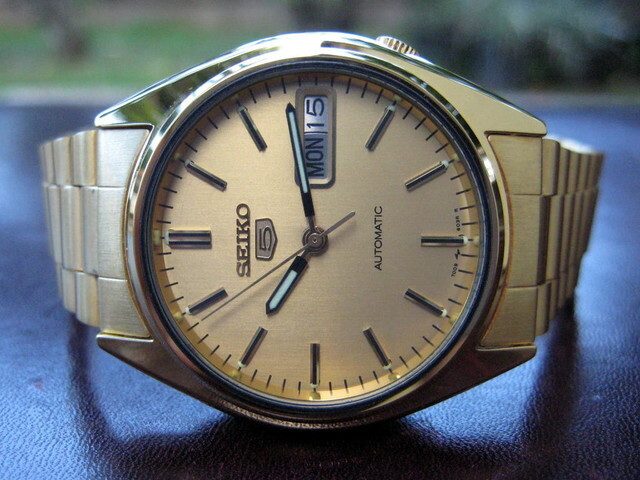 To sum up, the gold-plated Seiko 5 dates to January 1995, the final year Seiko 5 was powered by a 700x movement. Are these two the Oldest or the Newest? ...Off to sleep now, and more to come this evening NZ time. The diver I discounted because it simply didn’t look old enough and figured it was late 80s. I knew there were older watches. The Seiko 5? Discounted because it looked new... or near enough. Not any brassing. No signs of wear and given that figured it was not the one. Pictures tell a 1000 words. 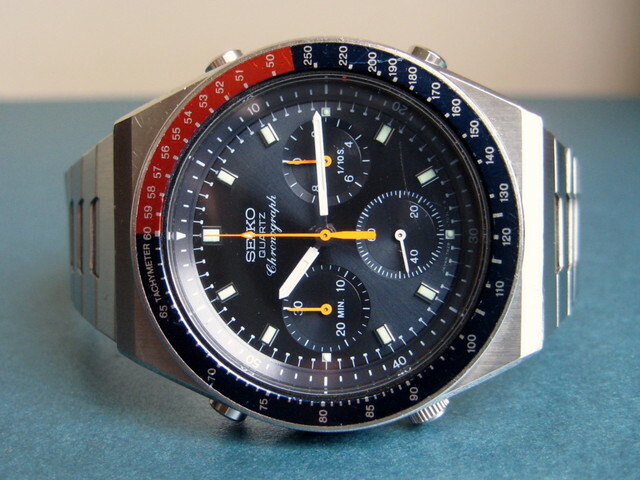 I mentioned previously that most people here would be quite familiar with this Seiko Quartz Chronograph. Not only are these pieces a major milestone in the world of watches, being the world’s first analog quartz chronograph, but one with an attractive tri-compax design. The watch is of course a Quartz Chronograph 7A28, officially introduced in 1983, and this particular example being a 7A28-703A. The vast majority of the 7Ax8 chronographs were in production until that late-1980s, though some variants were made up until the early-90s. 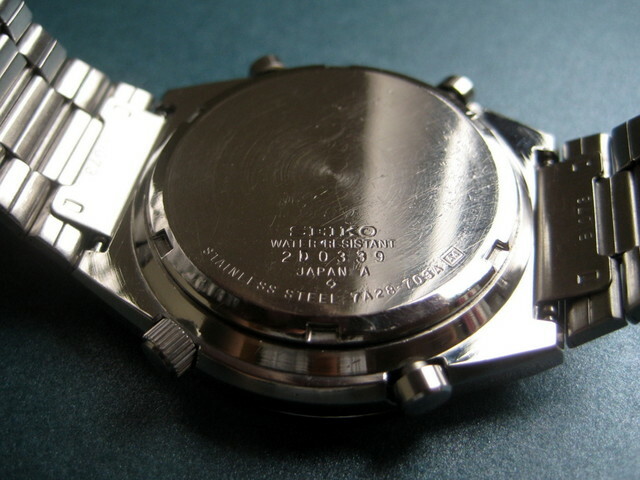 The watch shown here was likely among the first 7A28 that Seiko made, with a production date preceding the official release date. This has been a common occurrence with Seiko, e.g. the first Cal 6139 Chronographs were manufactured as early as May 1969, even though the watches themselves were only announced later in the year before being available in stores in December 1969. Last edited by Don; 23-03-19, 21:45.